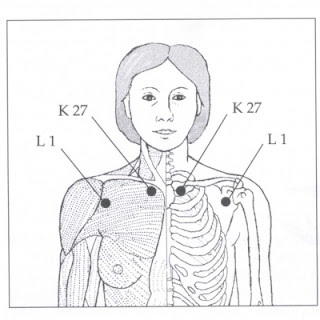 Acupressure points K27 are located below the collarbone and are called 'energy buttons' as they are meant to boost your natural energies. It helps boost your natural energies and resets your electro-magnetic body. For getting more energy, clearer thinking and improved vision, stimulate these energy boosting buttons before arising in the morning and start the day smoothly. Location: In the hollow below the collarbone next to the breastbone. To find the K 27 acupressure points place your fingertips below your collarbone. Rub with firm pressure, feeling for an indentation and soreness. When you get the point, you will feel a connection with your throat or chest, especially when you deepen your breath. According to Traditional Chinese Medicine (TCM) acupressure point K 27 is an effective point for relieving throat, chest, and back pain. It opens your ability to breathe deeply, which is key to releasing endorphins, the neuro-chemicals that relieve pain. It helps reinforce immune system functioning by strengthening the respiratory system. K 27 (on both sides) are good for most of the respiratory problems like: chest congestion, phlegm, coughing, throat spasms, sore throats, shallow breathing, difficult breathing, chest tightness, chest pain, allergies associated with chest congestion, breathing difficulties, asthma, coughing, and sore throats. It helps getting relief from anxiety, agitation and thyroid gland irregularities. Hot flash symptoms due to menopause can be treated with acupressure including K 27. It is used to strengthen the immune system and treat depression. If your fatigue is depression-related, this can be a useful point for reinvigorating you. Some acupressurists say that 'it is the most effective acupressure points for balancing the health and functions of the body. When you open K 27 by holding it for a couple minutes while breathing deeply, the benefits of this acupoint increase. Use the right hand to stimulate the left K-27 and the left hand to stimulate the right K-27 while the opposite hand is placed over the navel. It is important to always ground at the navel. Stimulate K-27 points with firm rotary pressure for 15 to 30 seconds each or until the pain at the points subside. * How to Manage Your Menopause Symptoms with Acupressure Therapy?